This weekend, I finally finished landscaping my front yard. It’s been a process since we got a large dieing tree removed. The tree was the majority of the cost of the project since I was unable to cut it down myself. Most of the work involved trying to get rid of all the rock around the base of the tree. The previous owner thought it was a good idea to have a dump truck load of rock dumped into the front of our yard. For the past few weeks, I’ve been spending my weekends slowly digging up rock that’s been settling for over twenty years. On Sunday, we had the last of a few people from Craigslist come to our house to haul the stone way to a new resting place. I don’t care to see another piece of river rock again. The last two days I removed the rest of the ivy that grew over top of the rock and three dead bushes, received deliveries of dirt and mulch, graded the yard away from the house, and planted grass seed. Last night, was the first night I hadn’t done something in the front of our yard for about a week. It felt great. Go build it. You might be surprised by what you accomplish. 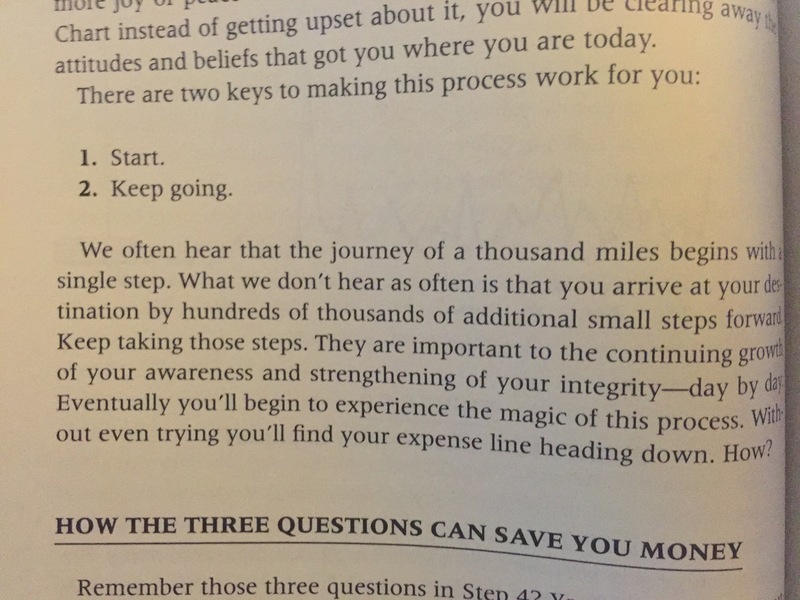 The above passage is an excerpt from the book, Your Money or Your Life, and it’s meaning is very similar to the blog I wrote about yesterday, Like a marathon. They’re both about the best way to achieve any of your goals. Keep going. Those two words seem so simple. If they are so simple then can someone tell me why they are so hard to stick to? To keep going on any goal, no matter the size is difficult. I give anyone credit, who can stick to a goal for a specified period of time. This is my biggest problem. I start a lot of goals but sticking to them is my biggest issue. That’s what this blog is all about. It’s my commitment to write everyday. Today, I’m going to think about the goals in my life and how I can break them into a thousand tiny steps. Any goal you’re trying to achieve can be treated like you’re training to run a marathon. I’m currently training to run the Pittsburgh Half Marathon for the Light of Life team. I ran my first full marathon in 2013, and the key to completing a marathon is to complete all of the necessary training in the three or four months before your race. In short, you need to put in the miles. Most people aren’t going to be able to run a marathon tomorrow. Similar to the way you might not be able to get your dream job tomorrow without putting in any of the necessary work. Also, you won’t be able to complete that big project you just started at work tomorrow. You can break the work you need to complete down into small manageable daily goals. Then you can start completing one thing everyday. That’s how you complete a marathon. It’s pretty simple. Anyone can do it, but it’s still hard because committing to anything is difficult. Waking up everyday and sticking to your goal is hard. Many people don’t want to commit. It could be any number of commitments: running a marathon, waking up at a particular time, writing, practicing, or completing some type of todo at either work or home. You need to work on them everyday, otherwise, you’ll never be able to complete the marathons in your life. What are your marathon goals? Think about how you can break those tasks into small manageable goals you can achieve everyday. Now start completing them. Gary believes people will probably be less likely to say, or do, horrible things online if those things would be displayed while performing a simple search on the persons name. Think employers, family, or friends. It’s a good lesson for all of us to think about before we do anything online. Even though this search capability doesn’t work exactly as I stated above. How long do you think we’re away from that type of information, or how much longer will it be until some hacker figures out a way to disclose the identities of the behavior you thought could remain anonymous? It’s probably not far away. Instead of telling your kids about being on the cover of the front page of the paper. You should ask them if they would be okay with a particular action being visible on their Facebook Wall, Intsagram feed, or Google Search. We all need to rethink our idea of privacy. If you’re uploading anything to the internet, then you should realize your information, media, or conversation is no longer private. My palms were sweating, heart was racing, my mind was churning through each of my points, and I was about to walk to the front of the room to give my first speech at Toastmasters in June of 2013. I was attending regular meetings for about a month. I did a table topic and some other roles. Thinking back makes me wish I would have video taped some of those past performances. I would have liked to see the difference from today. Before joining Toastmasters, I can’t say I didn’t like to speak in public but I got nervous to speak. Three years later, I find myself trying to give a speech every week. Even a year ago, I wouldn’t have thought this was possible but I’m now into week 13 of my 2016 goal. It’s been pretty amazing. It’s been kind of overwhelming to come up with material but the pressure has helped me grow. I think I’ve actually given more than a speech every week since the past week or two I’ve been practicing my competition speech. It took me a while to to get over my fear. It wasn’t exactly public speaking but really talking in front of strangers. This fear was also one of my roadblocks to expanding my network. That’s another area Toastmasters has helped my build upon. I plan to continue building my network and getting involved in different communities like Toastmasters. Don’t be afraid. Fear is something happy people don’t worry about. Happy people aren’t afraid of being afraid. Conquering my fear of public speaking by standing up one day at a time has helped me in many areas of my life. That’s all I’m trying to do. This was a great weekend. I think I gave the best speech of my life but that doesn’t mean it couldn’t have been better. My goal going forward is to continue to give a speech every week but continue focusing on practice and perfecting the little things that make a speech great, like eliminating my crutch words, improving vocal variety, body movement, and eye contact. The key for me is practice, practice, and more practice. Keep standing up every week. When I was young, you could usually find me sitting at a table with a pencil, crayon, marker, or pen scrawling all over a sheet of paper with usually a whole mess of extra pages scattered around the table. Similar to most children, as a child I loved to draw. I’d almost anything and I’m sure they were pretty weird. It would be cool to go back and look at them. The only I remember drawing often was military battles between tanks, fighter jets, battleships, and submarines. That might seem weird to parents today, but I was a kid who grew up with two Grandfathers who served in World War II and the most popular cartoon was GI Joe. I might have had a hundred GI Joes with tanks, airplanes, and battleships. I drew what I knew and liked so I drew epic battles between those four types of fighting machines. These drawing sessions also included the necessary sound effects which I’m sure embarrassed my Grandmother while I was drawing during Sunday mass. The is that happy kids, happy people, don’t ignore obvious sources of fun. I didn’t ignore drawing as a kid. I don’t think I ignored any fun as a child, but as I became an adult I ignored fun everyday. I quit drawing because a elementary school teacher told me that the colorblind kid probably wouldn’t make a good artist. This was probably one of the worst decisions of my life. Now, I’m back drawing. I drawing my old battle scenes on any scrap of paper I can find. I imagine most people wouldn’t call this art. Well, they’re probably right, but I don’t care. I enjoy my crappy drawings. I have fun with it and it allows me to play. I don’t spend as much time as I did as a child, but I try to complete my drawing a day. They’re simple, they can take as little as a minute. I ignored sources of obvious fun for too long. I’m done playing that game. Now when my kids ask if I want to dance, go to the park, take a walk, or draw, I never hesitate to say, YES! Group projects, picking a college, internships, job search, career, graduate school, side projects, charity, writing, public speaking, working out, and relationships. These are some of the things I always wanted to do on my own or on my own terms. I never wanted anyone’s help because I thought it was cheating. Doing things on your own will teach you a lot about yourself. The one thing it will definitely teach you is that this idea, of doing everything on your own, is one of the biggest mistakes you can make in you life. Luckily, a few years ago I finally figured this out for myself. You can do things on your own. You’ll find them rewarding, but doing those same things with others makes both the upside and downside more enjoyable. If you’re looking for a new job, your network, or the network you never knew you had, will be a key to finding your next role. If you only plan is to send a resume and cover letter than you’ve already lost. Working with your connections will help you find a better job faster. Working with other people will help make the progress towards you goal easier and more enjoyable. What would you rather do? Bang your head against a locked door or let someone you know open that door. Successful people don’t go it alone. They know they can achieve far more by working with other people.